I like using lots of images in my social media, but there are times when I don't have the kind of picture I want and don't have the means of taking one. That's when I rely on stock photos. I use Pixabay because they have a ton of photos, a search function, and it's free. I grabbed a grungy looking picture to use for my background, added a picture of my cover, and that was it. I actually used a 3D book image with my cover. I'm not to go in depth on how I did it, but this video shows how to make one. I opened up Canva, an amazingly simple graphic design tool, and uploaded my two images. I originally used the Facebook Ad template, but it made a file which was way too big. I ended up scaling the image size down to 506px x 265px. Use whatever size works for you, this is just the size I decided on. The frames I used were really simple. I had the background and some text, and that was about it. Since I wanted the text to fade in line by line, I copied the page with all the text and deleted a line in each new image. 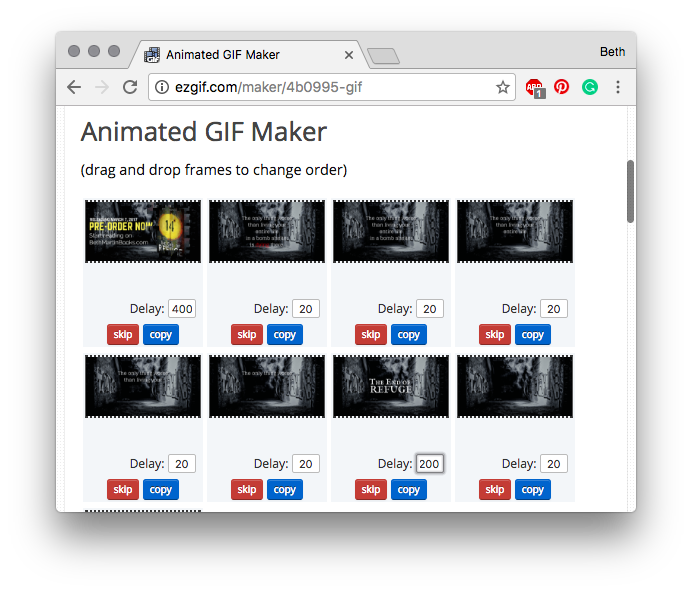 There are a lot of free gif creator tools out there. I use ezGif.com. Click the GIF maker tab, choose the frames we just made, then click upload. From this point, I just rearranged the frames and changed the delay. Delay is how long the animation displays each frame in milliseconds. I made the frame with the cover image longer and kept the rest pretty short. You could leave it at that and just click "Animate It! ", but ezGIF.com can also add nice fading between frames. Just click the "crossfade frames" box under Effects. I use the default fader delay and frame count, but you can tinker with the setting and find what works best for your project. This does create a bunch more frames for the GIF leading to a much larger file, but I think the aesthetic quality it gives is well worth it. Since my GIF was huge, I clicked the optimize icon and applied one of the compression methods (I used lossy GIF 30) to shrink down my file. I wanted to keep it under 5MB so I could share it on Twitter. Just right-click or control-click and save the image to your computer. With my completed GIF, the next step will be to share it. 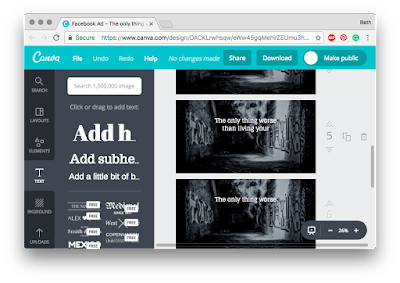 I use Giphy to host animated GIFs because the site makes it easy to share them on FaceBook and Instagram. So that's it. That how I made my teaser. If you make one, please share it with me on Twitter or my FaceBook fan page!